Friend of gold Jim Sinclair, and executive to a mining firm with interests in Tanzania, put it so well. He captures the theme of this article when he said, "It is the constant drop in the dollar's usage as a contract mechanism internationally. No one sees this but it is the Hammer of Thor on the head of the dollar." The rejection of the USDollar in global trade will mean the end of the abused privilege in a currency turned toxic. Its rejection is the marquee event in the financial world for 2013, following isolation. It is unstoppable and all-encompassing, certain to have geopolitical consequences, as it alters the economic and financial landscape in harsh ways much like a band of violent marauders brandishing machetes alter the neckline of their victims. See the Tonton Macoute in Haiti. The greenback is cornered; it is done! The central bankers and sovereign wealth fund managers are running scared. The Official Monetary & Financial Institutions Forum (OMFIF) is a forum of central banks, sovereign funds, financial policy makers, and market participants. It recently issued a report on the global monetary system, emphasizing the possibility of a major breakdown in international monetary relations as a result of the currency wars, which hinder productivity. It accepts that the present system is collapsing. It argues a formal role for gold is required to play in international finance. But they turn to the despised corrupt savage callous Intl Monetary Fund, and its broken currency vehicle, the discredited discarded SDR basket. They will be swept aside despite eyes partly open. The opponents to financial hegemony have spent the last four years in planning a new order that can viably sustain the global trade system without a USDollar at its central role. On one side, foreign nations must avoid the toxic effect of the asset bubble USTreasury Bond as the core to their banking systems. On the other side, foreign nations must react to the accelerating threat to their national economies from both a uniform cost inflation effect and a rising currency effect that punishes strength, success, and prudence. The Competing Currency War has reached a new elevated fever pitch, with the major central banks delivering powerful damage to each other while defending themselves. The unintended consequences have been a predictable unfolding of events to the sound money gold crowd, with years of warning and even a label given to the conflict. It comes as an unwelcome surprise to the mainstream sheeple crowd, still entangled in the paper wealth corner. The process continues, the pathogenesis relentless as paper securities erode in value. The world is slowly coming to the realization that only a Gold Standard can cure the world of its financial cancer from metastasized paper insecurities. The contact of Silver will cleanse the hand that has held paper since 1971, when the era of modern chronic unsolvable financial crisis was born. That is, unsolvable without a primary role for Gold itself, the despised stable metal. Gold is the ultimate currency. So the Jackass call is that 2013 will see the USDollar finally isolated and put in a position for rejection. It might not suffer a sudden death, but it will be corralled after being identified as the toxic agent flowing within the global financial arteries. However, the quarantine will be conducted in an extraordinarily clever fashion. Since the United States and United Kingdom, with its loyal court of followers in Western Europe, control the global banking system, the sovereign bond system, and the FOREX currency system, even the commodity markets including Gold & Silver, the solution had to be loaded with innovation if not guile. The alternative to the USDollar as a solution had to be formulated and planned as a counter-attack, but done so outside the oversized pockets of strength where the Anglo bankers ply their trade and controls. As many trade partners have been public about their objectives, when two parties come together to conduct trade, no rational reason can dictate that the USDollar should be used as a vehicle to settle trade, when both parties are located halfway across the globe. The New York and London bankster crowd cannot dictate Gold's new role, when their vaulted gold supplies are being vacated to points in Asia, when their vault contents are demanded in official accounts for return, when their past gold shipments have been contaminated with tungsten. These banksters are being outed as criminals. The end to US & UK hegemony is coming. It will arrive like a grand lasso cast around the set of trade partners seeking a fair system. Their proffered solutions will be ignored, like the QE lunacy in the United States and the ESM lunacy in Europe, both discredited totally. The IMF will not play a role in the next chapter. The irony is thick and inescapable. If the Anglo bankers insist on NOT considering, using, and relying upon Gold as a currency of utmost validity, robustness, and strength, then the rest of the world will devise a system for trade settlement that will evolve toward gold itself. The settlement of trade will not therefore pass through either the banking system or the currency marts. The solution will come in global trade that no longer requires the USDollar, but rather a simpler system where value is perceived more clearly, where the two participants will transact as peers, where payments will not rely upon the big banks, where the ignored super currency Gold is the basis. The deceptions of paper-based IOUs will be averted. The corruption in the banker shell games will be cast aside. The USDollar will be isolated, ignored, shunned, then put to death by the Americans themselves during its uncontrollable fever. The grand hint to the end-around solution in search for a USDollar alternative has been in front of the nose for several years, dating back to the China-Brazil bilateral swap deal in 2005. Little attention has been given a long sequence of similar bilateral swap deals that have centered upon the Chinese Yuan for initiating and settling trade. Nation after nation have lined up with the Beijing leaders to conduct trade in something akin to a credit card account based in Yuan currency, which converges toward zero over time on balance. Trade is initiated by one side delivering goods. The swap facility is tapped. Trade goes in the other direction, and the swap facility is credited toward zero. Numerous nations have signed up with China on such bilateral swap facility deals that enable brisk trade, in essentially a barter framework. The word barter is never used, since it might upset the powerful banker groups that shuffle bonds and currencies like so much stained wampum and contaminated salt at the corrupted trading posts. With Russia, South Korea, Japan, Iran, India, and Australia onboard with Chinese Yuan swap deals, one must suspect that a critical mass of perhaps half of global trade is conducted outside the USDollar shadow. This is a growing critical mass that acts much like scattered pylons on which to place a new trading platform. The key is that the collection of bilateral trade conducted by China is no longer done in USDollars. The objections are openly stated, that nations do not find it obligatory to settle trade in a third-party currency like the USDollar, especially when the US central bank is flooding the system with USDollars of highly suspicious origin but with very certain negative ramifications on the value of nationally managed reserve systems. The other big more recent hint is that Turkey is serving as a test site for trade settlement in Gold. Ankara bazaars are providing Gold in giant quantities, used in satisfying trade payments. So far the sleep Anglo bankers consider it minor, and operating in the Iranian shadows. They are wrong. An important dynamic must be made clear. In the past decades as nations engaged in trade, in particular with crude oil, the trade was settled in USDollars. Therefore nation after nation accumulated USTBonds in their surplus reserves account as part of banking systems. They followed the lead set forth by the Saudis as they managed the Petro-Dollar functions. The Saudis recycled their surplus funds into USTBonds, so as to keep the balance of FOREX currencies intact even as massive imbalances built up quickly over time. As a result, the entire world of major nations, the global producers and traders accumulated USTBonds within their banking systems. The norm became USTreasurys with which to build national banking systems. So the Saudi-led Petro-Dollar established global trade done in USDollar terms, even outside the energy market. In a sense, their reserves management as agreed upon between the USGovt and Saudi royals (King Fahd), induced the global trade participants to follow suit and create banking systems built upon USTBonds also. All that is changing, since the Chinese Yuan swap facilities have taken on critical mass globally. However, the final blow to the USDollar will come from standard non-energy trade being settled outside any US$-based terms. The practice is accelerating, initiated in Asia, but spreading westward fast, urged along with a giant push in response to the Iran trade sanctions. Every action brings about an equal and opposite reaction. Do not be surprised to see the Chinese Yuan later as interchangeable with the Gold Trade Note. But first the Yuan must be convertible into the many major currencies actively traded in the world. Numerous reports have come in recent weeks that the Yuan currency will soon have a gold backing, yet unconfirmed. My expectation is for the Chinese Yuan eventually to be interchangeable with the Trade Note. That will signal its implicit gold backing. While many events and steps are not known, and many surprises will be thrust on stage, the guiding pathways are slowly coming to light. The Competing Currency War has grown in intensity. The competitive devaluations of currencies is causing severe damage among the major players. National reserves are suffering loss, while growing in size to dangerous levels. Protection of export trade has become of paramount importance. Nations are speaking openly through their central banks about the distress and urgency of the worsening situation. Russia has directly identified the currency battles as war. Nations are acting in their best self-interest, and in the process defying other nations, rendering them harm. With Switzerland and Japan enduring the brunt of the currency wars, look for them to each arrive at the conclusion that a Gold Standard would eliminate many problems. They are important pivotal nations. Successful nations and safe haven nations are put at great risk, even punished by having their floating currency rise. Great distortions are occurring as the Euro is propped, the beneficiary of colossal USDollar swap facility influx in the $trillions. The nearly constant US DX currency index is a lie, a false soothing signal that all is well. In fact, the USDollar is seeing instability with several currencies within the index. The list of nations undergoing active currency intervention is growing markedly. Currency manipulation actions are routine, each action inviting a reaction by other nations. It is not just Japan and the United States, the usual suspects. It is Luxembourg, Switzerland, South Korea, Sweden, Norway, and Brazil. Heck, even the venerable England has taken steps to create a Chinese Yuan swap facility. They do not wish to be left out when the Yuan becomes a more global currency, with full convertibility. London is aiding the path to a convertible Yuan. Who'd a thunk it? London wishes to remain a major trading center. Look for someday soon a Chinese Govt Bond auction denominated in Yuan, the offering managed by London banks. Such a development is not welcome news for New York, which must be seething with anger and flush with disgust. This is the more than a currency war, but rather a global currency tumult and transformation, with grand tectonic shifts, on the disruptive path to a return of the Gold Standard. Some important events within the financial wars over control of money and determination of value is underway. Many details are analyzed in the January issue of the Gold & Currency Report for the Hat Trick Letter. Big disruptions are coming very soon to both the FOREX currency market and the Gold market. Gold price breakouts will occur in various currencies, but not in US$ terms, the defended bunker. The new dangerous phase of the competing currency war has the propped Euro keeping the US DX index up, since the Euro has an absurd overweight in the queer index (artifact of past era). The Gold price rise will come like a sudden burst of wind. The speculators who trade Gold based solely on the DXY index will not understand the processes going on behind the scenes. They will be greatly surprised and taken off guard by the poweful upward move in Gold when it arrives. Watch for the Swiss and Japan to knock on the door for entrance in the Eastern Alliance, which will produce the USDollar alternative. It requires a critical mass for success. The stress felt in these two nations will motivate their pursuit of the USDollar alternative solution. They are being seriously wounded by the fiat paper currency system with floating rates. Russia spoke out viscerally on the growing global awareness of an open currency war. Events are not of a fresh war, but rather a climax. Russia's central bank head Alexei Ulyukayev seems only recently aware of the battles among central bankers that have raged for a few years. The climax could result in a Gold Standard implemented in place, with the Anglo-Americans deposed. The practice of competitive devaluation has turned routine. All actions taken by individual nations invite quick reactions by affected partners. Conversely, the successful nations do not tolerate punishment with a higher exchange rate. A return to gold in a central role would provide reward instead of punishment. This is the currency war entering the final phase, where the Gold Standard could potentially emerge as the global solution. The returned imposition of the standard would enable successful nations to garner more gold as reward (see Norway, Switzerland), and punish sluggish wayward parasitic sclerotic socialist nations which run chronic trade deficits by sending them to the Third World. Recall the shattered objective made in 2009 by central bankers. Their vacant call was reiterating just three months ago, to refrain from competitive devaluation of currencies. No nation refrained, as it is total empty rhetoric. When pressured and under attack, individual nations will act in their own domestic best interests, to defend their industries, to fight to survive. Brazilian Finance Minister Guido Mantega first dubbed a currency war in 2010 in open terms, engaging the richer nation. He must be credited with the initial challenges and confrontations of the major central bank powers. Luxembourg Prime Minister Jean-Claude Juncker complained of a dangerously high Euro. Its 7% gain against the USDollar in the past six months poses a fresh threat to the EuroZone economy. The European Central Bank states that it is not prepared to favor a weaker currency. Switzerland has been blocking the Franc appreciation against the Euro since September 2011. Their central bank balance sheet has gone over 70% of GDP, but will fail to achieve any success. Great losses await in the blowback. The central bank of Norway (Norges Bank) has received pressures from the finance ministry, in reaction to a strong Krone currency. The ministry urges more accommodation, and not to continue conducting a tight fiscal policy. The Krone has been rising due to a responsible government, and long successful North Sea oil project with about $1.6 trillion held in sovereign wealth funds. The central bank of Sweden wishes to execute a rate cut in order to avert a stronger Krona currency. The Riksbank head has argued for deeper rate cut than the 0.25 basis point enacted. They prefer the basic self mutilation method. Japan has reignited new major battles, as newly elected Prime Minister Shinzo Abe urged a more aggressive central bank, turning it into more of a political arm. The result has been an 11% Yen decline since December against the USDollar. Their 22-year interventions are a total disaster, and example to observe. Expect Japan to join forces with the Chinese in common goals. The Bank of Korea has formally stated an urgent response is needed to defend against the falling Japanese Yen. Concern is over the harmful impact to exports and investor confidence. Their finance ministry wishes to put forward an agenda item at the G-20 talks in Moscow, on adverse effects of monetary easing in the United States, Europe, and Japan. Expect South Korea to join forces with the Chinese, as they diversify out of USTBonds. The official program launched by the Bank of Japan delivered some powerful blows to the Swiss bankers and their lunatic peg against the Euro currency. Defense of Japanese industry has translated into outsized losses for the Swiss central bank portfolio, simply put. Extreme risk continues to rise toward a break point in Switzerland. Their Euro-Franc peg cannot be held firm. As the Euro continues to crumble (regardless of exchange rate), investors are flocking to the Swiss hills. The Swiss National Bank cannot hold the 120 declared peg. Their short Franc position and long Euro position, with other major currency long positions from some diversification (like into the Japanese Yen), will assuredly break as each major nation manages according to their own national priorities. The urgent Euro defense has prompted other nations to take defensive action. The war is on. A new phase has begun, with damage done to other nations rising. The Swiss Natl Bank has converted itself to an ill-fated hedge fund in danger of massive losses. Its losses are mounting. Its reserves from Franc defense are in the 75% range of their national GDP, the size of their economy. The Euro-Franc peg is doomed to fail, with gigantic losses to come in the cascade of ruin. Note that the Japanese Yen has moved down hard in four months time, and continues down. A look at a 50-year chart (shown in the January Hat Trick Letter paid reports) should cause alarm, since the trend over two generations appears to be in the early phase of an important reversal. The JapYen is falling rapidly by designed pressure from their central bank, which has been politicized radically in recent weeks. Massive losses are coming from the Swiss bets on the Yen, along with catastrophic losses from an explosive upward move in their own SwFranc currency. The focus of the Competing Currency War right here right now should be squarely on the Swiss and Japanese. They are at war with each other, blowing up the Swiss reserves. The Swiss thought they were acting prudently by diversifying out of the Euro and into the British Pound and Japanese Yen. The BPound is down from 163 on January 1st to 156 today, almost a 5% decline in merely five weeks. The JapYen is down strong, from 129 in late September to 107 today, falling with powerful momentum. The Asian currency is down a monstrous 17% in the last four months. Japan is trying to push down their currency in order to make cheaper their exports. On the other hand, England is just falling apart, in a nasty recession. The Swiss National Bank went all in three times and counting in the last several months, with heavy commitments to defend against a fast rising Swiss Franc currency. 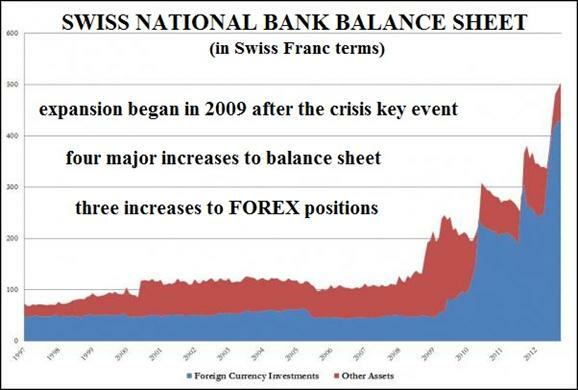 The Swiss have a truly massive and deadly commitment, seen by the size of their central bank balance sheet. It is like a giant boil on the Swiss face. Details of the interventions are full of intrigue, if not highlights of the futility. Huge losses await the small nation dominated by its banks. The bankers have gone coo-coo, like their clocks. Compare. The USFed has a big balance sheet, equal in size to over 20% of the USEconomy size, as measured by GDP. The Euro Central Bank goes further, with a balance sheet of 30% of GDP for the EuroZone. The Swiss take it to a new level, two to three times larger. The balance sheet of the Swiss National Bank contain assets amounting to about 75% of the Swiss GDP. They have literally bet the bank on three separate occasions recently. The nation is small, but the carried risk is staggering, enough to collapse their financial system. It is already badly damaged from a) the loss of secret private accounts, b) the loss from underwriting mortgages in Eastern Europe, and c) the loss from US$-based toxic bonds. Next comes potentially catastrophic losses from currency regime defense, compounded by legal challenges on Allocated Gold Accounts with accompanying multi-$billion lawsuits kept quiet. The big irony in the Jackass viewpoint is that the Swiss will become a key force as an important swing vote. The potential is there for a hidden role. They might join the global gold-backed currency movement that replaces the USDollar in trade settlement. This is the currency war entering the final phase, where the Gold Standard could potentially emerge as the global solution. Imagine Switzerland with its impressive flow of funds into the Swiss hills, seeking safe haven from the collapse of Europe. A Gold Standard would mean that gold bullion would follow the flow of funds, the exact opposite impact as the current situation for the historical land of banks. So Switzerland could serve as a big swing state in the financial sector, like Turkey could serve as a big swing state in the trade settlement sector. Rumor is circulating in London that neither the United States nor the United Kingdom will attend the G-20 Meeting in Moscow. Refusal to attend by the Anglos would open a giant gate to coordinate plans by the leading Eastern nations (trade participants) on the new trade settlement system with attendant platforms. Rather than creating a new and better currency, they are more likely to establish a gold-backed trade settlement process that will render the USDollar obsolete. Failure to attend by the US-UK tagteam of financial fascists would ignite the Eastern-led consortium on motivation toward the launch of the new system in a more open public vocal manner with press conferences. The Third World awaits the nations that refuse to become part of a growing critical mass in global trade, which desires a more fair and equitable system of trade settlement. It is coming, but awaits a climax of collapse. The Jackass finds little value in the Gold chart, the object of criminal control. Honestly, rarely is the so-called official gold price checked for months. By happenstance, it flashes across the television screen when the bumblers on the financial news networks are silenced by my mute button. Their gold price is controlled within a boring false range of meaningless that does not attract my attention or interest. The actual Gold price is 10% higher than the posted COMEX corrupted price, in many parts of the world where it is actively traded in volume, with authentication and verified bars bearing certification. Much of the New York and London gold is either stolen or confiscated, their stated inventory as full of fiction as the economic reports. Moreover much of the exported Anglo gold has tungsten centers. Their gold bars are as imaginary and contaminated as their sovereign bonds and mortgage bonds. So the Jackass sticks with the gold and currency wars, the developments by the stubborn resistant East, and trends toward the sunset of the USDollar after it is cornered like a rat. Ignored are the marquee billboards with false prices from leveraged fraud, naked shorting (see the Big Four US Banks), theft of client accounts awaiting delivery (see MFGlobal), surrogate wars to confiscate foreign gold accounts (see Libya), and raids of the Gold ETFund often called the bullion central bank kitty. The Jackass refuses to permit syndicate whores and harlots to define virginity or purity, or to set the price of taking a lady out to dinner, a show, and whatever follows. The entire pack of Western bankers can go to hell, whose doorkeeper prince of darkness is their object of worship in rituals. A sweeping captivating question will dominate in 2013: What happened to the United States? The answer cannot be made simple. As preface, the key to comprehension must bring focus to extreme banker thefts in the multiple $trillions, which began in a virtual theft of the bulk of the national home equity in the mortgage bond fraud. The problem is far more pervasive, if any degree of depth is to be grasped. It was the refusal to liquidate the broken sacred banks steeped in criminal activity, the extreme corrosion to the economy from adopted sanctioned urgently requested hyper monetary inflation, the burdensome war costs hidden within the mammoth unfixable federal budget deficits, the compromised Congress whose constituents are lobbyists, the cancerous growth of the state which is realized in higher taxes, onerous regulations, an expansive welfare network, and a forced tiresome war on terrorism that conceals a broad confiscation of gold hoards during a global capture of the narcotics trade, upon which the New York banks are hopelessly dependent. A military element has been prevalent in the breakdown, an extension of the Fascist Business Model into the business sector. It saw impunity of big banks from prosecution, devotion to war, permission of narcotics by the security agencies, the obfuscation of liberty as it vanished, the perversion of patriotism (including honor guards at sporting events), the subjugation of the press, the salute to an aggressive national socialism (often dubbed nazi by the enlightened). Enter systemic failure from a military standpoint. The short answer on what went wrong would cite the departure from the Gold Standard, the advent of war beginning with Vietnam War and continuing through the Cold Soviet War and transitioning into a deceptive War on Islamic terrorism. The overly strong and active US labor unions caused a reaction to seek Asian outsources. The overly dominant financial sector led to dependence upon a series of aberrant asset bubbles, each and every one blessed by the wayward heretic US central bank, which owns a giant responsibility in the systemic failure in progress. The devotion to war has resulted in an added $3 trillion in the USGovt deficit just since 2003, and half the overall $17 trillion in total. A deadly decision was made in late 1999 that assured the demise of the nation, questioned by few, never having sat well with those in possession of an active economic brain stem. The discharge of the bulk of US factories to Asia, mostly to China, sent the legitimate income producing capability away, only to be replaced to a deeper dependence upon asset inflation. The resulting deficits for the USGovt cannot even remotely be repaid, nor even financed. Creditors have fled. The forced endless 0% rate is kept in place to enable debt service itself. Enter systemic failure from an political and fiscal standpoint. When the Hat Trick Letter began in May 2004, the Jackass was very clear that the US housing market and mortgage finance sector would eventually enter a bust period. Due to the extreme dependence by the USEconomy on home equity extraction and bond security trades, the nation would enter a period of deadly insolvency followed by systemic failure since no monetary policy could pull the nation out of the toxic quicksand. It had no traction in industry from which to derive stimulus of low interest rates. Imagine a car spinning its engine with a Weimar stamp on the block, whose RPMs rise multiples past the red line of danger, whose transmission spins the bank-made tires endlessly, creating a din of noise and a thick mist of burning oil, but whose wheels have no connection to the roadway. No critical mass of industry means no locomotion for the USEconomy, as simple as that. Besides, the United States cannot compete on a wage basis with Asia, nor a union basis, nor on a government regulatory basis, and increasingly on a quality basis. Enter systemic failure from an industry standpoint. In the last couple years, the systemic failure has extended from the USFed hyper monetary inflation, which kills capital itself in a manner that not 5% of economists comprehend. Central bank monetary policy to print nearly unlimited amounts of money, including funds destined for Europe, and to keep the official lending rate at the zero bound has resulted in a rising cost structure with no discernible increase in wages or income. Worse, the accumulated funds in savings and pensions earn nothing, therefore go negative when price effects are factored. The corrosive cost effect and the wet blanket savings effect on the USEconomy perpetuate the recession that has been firmly in place since 2008. No recovery has occurred in five years, despite the chatter and deception and lunatic pronouncements from the policy makers, compromised bankers, and poor excuses for economists (banker harlots & promoters). The USGovt deficits are covered over 80% in volume by the printing press with a Weimar nameplate. Foreign USTBond investors have vacated the auction pits and other financial premises. The reliance upon interest rate derivatives has been exposed, starting last spring and summer 2012 in JPMorgan admissions, in order to keep the absurdly ultra-low official interest rates in place. Enter systemic failure from a financial standpoint. The cast of leaders has converted treason into a facade of patriotism, as they defecate and urinate on the tree of liberty, preparing their drones and black aircraft for assaults on cities. The battles politically remind a history student of a localized conflict between Nazism and Stalinism, with a surefire blend in targeting the population with a parade of assaults typical of each camp. Anyone who has overlooked that Neo-Con means Neo-Nazi, and the march to Socialism in the other party has a striking tone of Soviet Collectivism, simply misses the big trend in American politics. The FEMA Camp influx for indoctrination, along with psychotropic drug treatment for those who fail to salute, should convince the masses a bit more. Events in the sky over Miami and Houston in the past week should do more than awaken, even frighten, as they spread to other cities. The collection programs for guns will be eclipsed by collection of private pension funds and perhaps gold itself. The exit strategy for the US Federal Reserve might be extremely simple, enabled by the heavy Big Brother hand. Over $19 trillion in private pension funds in IRAs, 401ks, and Keoughs might be forced out of their current positions and dragged into a new special USGovt Bond that is backed by unwanted USTBonds racked by QE storms and worthless USAgency Mortgage Bonds racked by lost collateral that the big US banks eagerly dumped on the USFed. The $3 trillion central bank toxic balance sheet could be passed onto the gullible helpless and victimized American public. Their only real choice is to flee, like the USTBond creditors. Self-protection will be deemed unlawful, either for personal safety or financial security. Speaking out in opposition will be deemed unpatriotic, if not subversive. Orwell, Huxley, and Thoreau are watching the obscene steps taken by the state. For some reason, fond memories of Richie Havens strumming his guitar and belting his tunes about freedom have been running in my mind for weeks, an icon from the 1970 decade, which produced the best music ever created in rock & roll.